An unusually small, French copper stock pot and cover dating from c.1890. Both the lid and the side of the stockpot are marked with a number '18'. This relates to the size as the pot is 18cm in diameter. 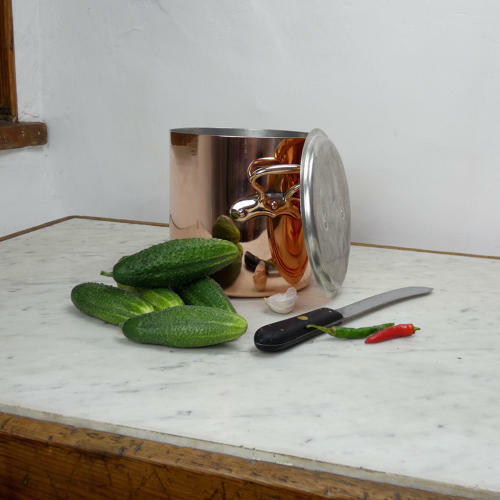 This piece is well made, from a heavy gauge of copper and it has the typical French shape of brass handle to both sides and also to the lid. It is in excellent condition and the interior has been re-tinned, in the traditional manner, so that it can be used. This would be a charming piece for taking from the stove straight to the table with a soup or casserole.